You’ll be happy to scarf down these SPAM-enhanced quesadillas after a long day on the trail. Slice the SPAM into thin slices and then fry them in a little oil until crispy on the outside, or to personal preference. Place one tortilla in the skillet. Arrange a quarter of the cheese slices to cover the tortilla. Then arrange a quarter of SPAM slices on top of cheese. 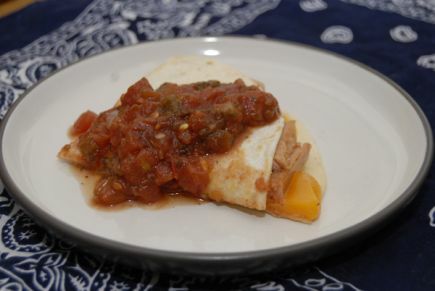 Place a second tortilla on top and cook the whole shebang over medium heat for about 3 or 4 minutes, until the tortilla is lightly browned and the cheese is starting to melt. Carefully flip the SPAMadilla with a spatula, cover and cook another 4 or 5 minutes until both sides are brown and the cheese is melted. Remove from skillet, cut into six wedges, and garnish with salsa, if available. Repeat for the other three SPAMadillas.